Home Tags Posts tagged with "#naruto #rolls"
The story with naruto rolls goes…. We love sashimi and every time there is an opportunity to go to a restaurant, we either choose Steakhouse or a Japanese. One day, we ordered a sashimi plate and with it came those Naruto rolls. 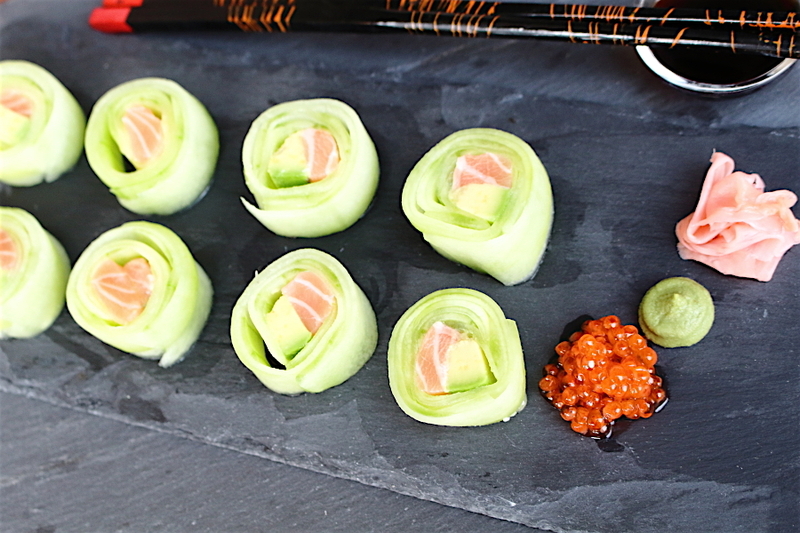 We immediately fell in love with them, since they are completely low carb and something a bit different to our sashimi orders we always made. Then on some other occasion, we went to another Japanese restaurant and I wanted to order a plate of only Naruto rolls. First of all, they did not even know what it is. I searched quickly on my phone and showed them some images. When the chef saw that, he immediately refused with an excuse, that this is very difficult to make and they do not offer it. Then a month later we went to the same restaurant we got our Naruto Rolls previously and happily ordered all of it. But what happened? we got the same answer. “It is difficult and we do not offer it”. With our explanation, that last time we got it here, they said, “Our chef changed”. Well and that was the end story of ordering those rolls anywhere. We have then tried a few more restaurants with the same answer. But as you know me already, I could not just leave it and decided to do our own at home. I went onto google and started researching and checking how to make them. It looked really easy, how the Japanese chefs were slicing the cucumbers on the videos. So there I went, bought a few pieces of long cucumbers and planned a day to prepare them. Unfortunately, as it always looks so easy on the videos, this was of course not the case. I have used 5 cucumbers, which I completely damaged and still could not get properly thinly sliced sheets. I started thinking, how else can I do it. I just wanted them so much, that I was not willing to give up. Went to buy a few more cucumbers and tried some other, a bit easier ways. Then one of my trials worked and therefore I can give you the tips and solution on how to make them without cutting your fingers or trying the professional Japanese way. Are you gonna try them? Let me know in the comments below how it went. I am really curious. 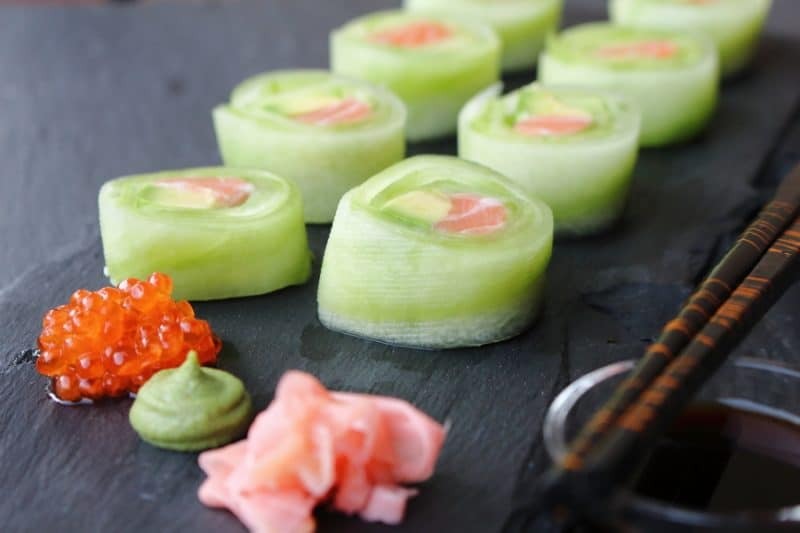 But if you are still needing the real sushi rolls, I mean in our lifestyle, have a look at our Keto Friendly Sushi Rolls Recipe, which might wow you as well. 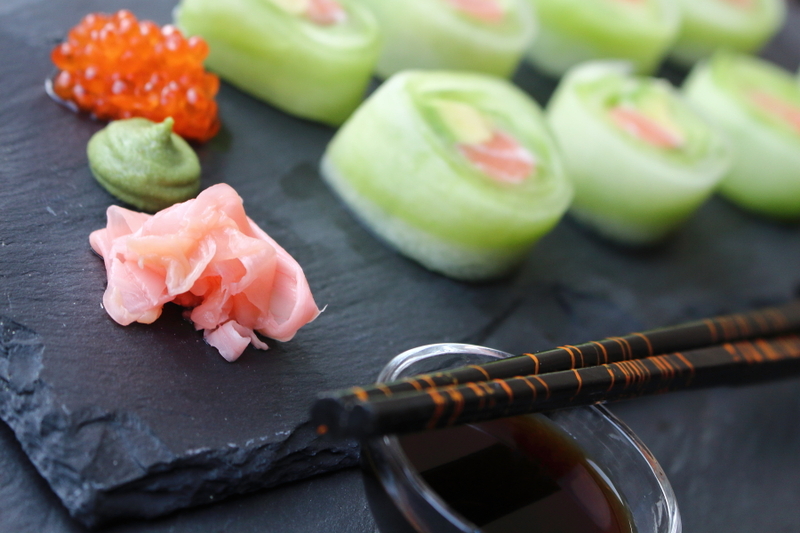 Line the sushi roll on the kitchen board and place cling film on top of it. Place the cucumber slices vertically in a way, that each slice overlaps the other. 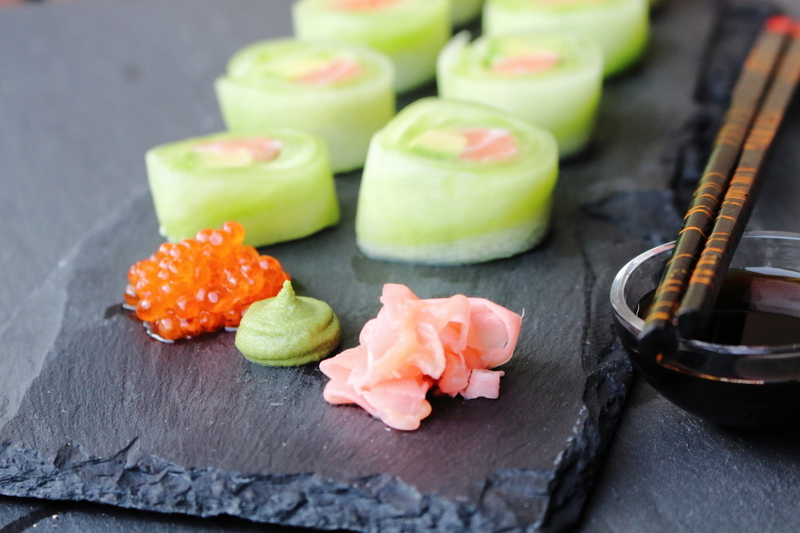 Slice your avocado and place it horizontally on a cucumber slices, same as making sushi rolls. Roll it the same way like sushi rolls and at the end gently press it and wrap with the cling film to hold the shape together. Once cooled, gently remove cling film and with a sharp knife cut the slices.